Find information on ski and snowboard rentals, Snow School meeting points, how to layer your clothing, and how to assess your ability. You have never ever skied or snowboarded before, and you want us to show you how to get started. You have been out before but only once or twice. It may have been years ago, and starting in the beginner area will put you more at ease while remembering how to control your speed, turn and stop. You have had some time out and your confidence is growing. The Green Runs are appealing because of their gentle slope, but you know that with a little guidance and some added skill, a Blue run is in your near future. Control on groomed runs is the name of the game. You avoid bumps and prefer the Blue Runs. Your adventurous side is calling to you to try something different. You feel that with some new skills, you may be able to venture onto a non-groomed run, some trees, a Heli or Cat Day or even a Black Diamond Run. You can get down anything with a Black Diamond, but just getting down isn't your goal - getting down with style, rhythm and speed is. Long vertical with steep terrain is what you crave. You want to go from the Front Side to the Back Side. You can still work on some technique, but really want to find those new and challenging lines. Powder calls to you and you aren't afraid to go out looking for it. Let's get out on the snow and show you how to go. Equipment familiarization and having fun in the snow while learning how to stop and turn are the focus. You're sliding, but stopping and turning aren't your strong points. Gain control so that you can access more of the mountain. Turtle Creek Beginner Area, The Last Spike from Mid-Mountain. You've mastered the magic carpet and now it's time to play on the long runs. Introduce mountain etiquette while refining the skills needed to ski with control. Green runs are good but it's time to explore more of the mountain. The Last Spike from the top of The Stoke Chair, Critical Path when groomed, Upper portion of Snow Rodeo down to the first intersection with The Last Spike, Snow Rodeo from the top of the Revelation Gondola, Hollywood, Ripper Connector, Burn Down, Chopper when groomed, Wooley Bully, Feller Buncher, Lightning Rod, Cannonball, groomed runs from Mid-Mountain. You've got the Blue Runs under control and you are ready to play in the bumps. Use a variety of terrain to develop all mountain skills. All runs from level 4 including: Hot Sauce, Separate Reality Glades, Chopper, SWF, Clyde's Secret Glades, Devil's Club, Snow Rodeo, Pitch Black, Fast Fred's, Short Shot, Short Final, Aspen Glades, 007 Glades, Meet the Neighbours, Unlimited Assets, Sweet Spot and more. 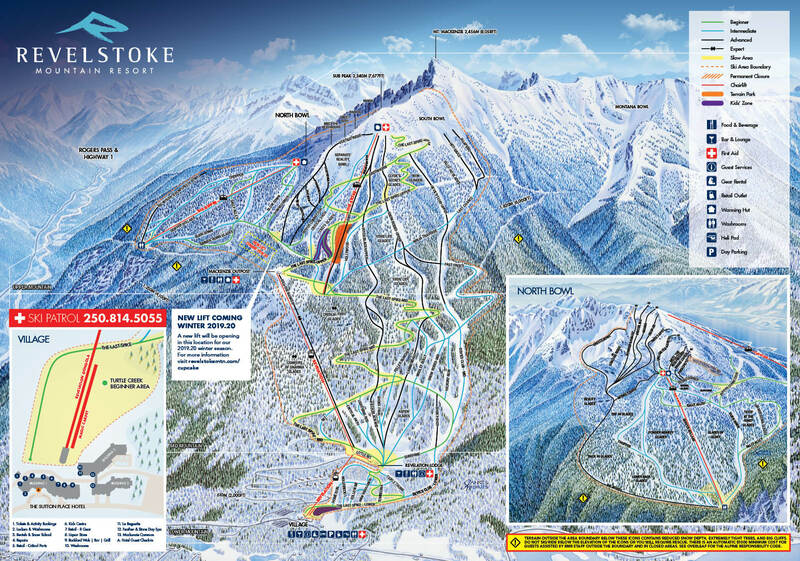 You have mastered the black runs and can comfortably ski anything on the mountain on your own. Steep runs and challenging terrain are your favorites and you are looking for technical improvement to ski faster and tighter lines all around the mountain. Sometimes you like to jump off things that would scare away your parents. North Bowl, Gracias Ridge, Greely Bowl, Powder Monkey Glades. Watch these videos to help identify your level of skiing ability.